This Week's Featured Advertisement: One Gently Used BrailleNote Apex 18-Cell Note Taker with Perkins Style Braille Keyboard for Only $2,100.00 USD!!! 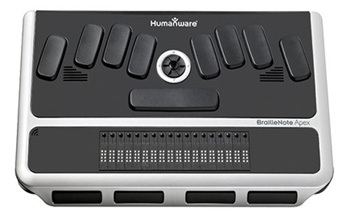 Flying Blind, LLC is very excited to have One Gently Used BrailleNote Apex 18-Cell Note Taker with Perkins Style Braille Keyboard available for only $2,100.00 USD, which is approximately $1,800.00 USD off of its suggested list price!!! For the past 13 years the BrailleNote name has been synonymous with excellence and innovation and the Apex continues to set standards that other notetakers have yet to meet. This unit is in pristine condition and is begging for a new home with a responsible user. This exceptionally priced gem will give you the time you need to have the time of your life! That, and its robust yet intuitive functionality will offer limitless options to whomever is first to receive it. This is a single unit that will be sold on a first come, first serve basis. Price includes shipping within the Continental United States. To be the first to secure this unit please use the Buy Now link included below. For more information or to order this product offline, email featured@flying-blind.com or call +1 (216) 381-8107 today! 1) Learn about Adobe Digital Editions, a versatile and powerful program for reading e-books, on the next CAVI-Cast on GMT Sunday, 9 March at 21:00. Keep in mind that most of us in North America launch daylight savings time that day, so don't forget to take that fact into account when computing the time in your time zone. There are abundant tools on the Internet to make the conversion, write if you need help. 4) Media Access Australia offers some general guidance on "Using screen readers on touchscreen devices:"
5) Version offers the Convoy 3, a simple phone with many accessibility features. Read this review on the NFB AT blog. 6) Thanks to the Audio Description Project of the American Council of the Blind, we have an "Alphabetical Listing of All Commercial DVDs With Audio Description:"
15 A-K) We have a few different sources for audio content this week to go along with the usuals. FACEBOOK: Are you on Facebook? Stop by and "Like" Flying Blind, LLC to begin receiving Top Tech Tidbits for Thursday as part of your Facebook News Feed at www.facebook.com/flyingblindllc. RSS FEED: If you prefer an RSS Feed, you can access Flying Blind, LLC Publications as they become available using www.flying-blind.com/feed.xml. YOUTUBE: If audio / video is more your style, then you can follow Flying Blind, LLC on YouTube at www.youtube.com/flyingblindllc. ONLINE STORE: Shopping for accessible technology? Check out the Flying Blind, LLC Online Store at www.flying-blind.com/store.html. All products offered in the Flying Blind, LLC Online Store are products that Larry L. Lewis, Jr. either personally uses, or publicly endorses. Flying Blind, LLC is proud to offer free shipping & handling on all orders over $100.00 USD within the 48 continental United States. TEXT-ONLY: Would you like to receive text-only versions of Flying Blind, LLC Publications? If so, find the link at the bottom of each Newsletter titled "Update Profile/E-Mail Address", and check this option. QUESTIONS: Tidbits is intentionally concise, and we know a lot of people may not understand some items because little explanation is given. If a particular Tidbit brings up a question in your mind, feel free to ask, and we will try to answer as time and knowledge permit. ARCHIVE: Visit the 2014 Tidbits Archive at http://www.flying-blind.com/tidbits2014.html where you can grab back issues. CONTENT: Any information for future issues of Top Tech Tidbits may be directed to our editor, Dean Martineau, at dean@topdotenterprises.com. SUBSCRIPTION OPTIONS: You can subscribe to Flying Blind, LLC Publications on the Flying Blind, LLC Website at: http://www.flying-blind.com or by texting "FLYINGBLIND" to 22828. Either method will provide you with an accessibly friendly and secure medium through which you can subscribe to our mailing list. Just enter your email address, click send, and begin receiving Flying Blind, LLC Publications. It's that easy.